Consider the 2 finish scenarios below, one a leeward finish, the other a windward finish. No current and a steady 8kts of wind. 1) At which position if any has each boat "finished racing"? 2) Does that answer change for any boat if they were alone at the finish or if there were boats close to either side of them? 3) For any boat that you determine has "finished racing", after that point is there any course or action that boat can take that would put them back in a state of "racing" for the race in question? Does Case 127 not provide the answers? John, Yes Case 127 (and a couple US Appeals) can be applied to develop some of the answers .. but it has to be interpreted and applied. This is the discussion I was hoping to initiate by providing the different scenarios in the 2 finishes. My point is not an interpretation, nor an analysis of the rules, it is just an idea of an old rules translator and teacher from times, when there was just the Rule and no Case, nor Q+A about this issue. "When the marks are behind a line abeam from the aftermost point of the boat's hull and equipment in normal position, the boat cleared the marks". I know, there are arguments about situations with current, but the above mentioned idea would make the life simple, and would avoid endless speculations and subjectivity. Pauls drawing would be solved in situation 5. (Or, if in sit. 4 would tack). To me in the original they have all finished racing at 3 as there was no tide, If I would have had a concern it would have been yellow finishing to windward but on balance happy. at 4 I am happy the boat has finished racing as the mark is no longer a factor in how the boat is being sailed. The fact that the boat tacks up the shore and in the tide cannot make the committee boat is a trap. The boat could have turned and sailed back through the line to clear or exit. So once past 4 there were choices that meant the mark was not controlling. Nice example from Paul, I like it. But, I would say that at position 5 the marks no longer influence the course of the boat. Therefore, she has cleared the line and is no longer subject to the racing rules. Her subsequent tack and problems don't warrant a penalty under the racing rules. Tide is a real problem and I have had cases where it has been minutes after finishing that a boat, which is struggling to clear the line has made contact with the pin. All they needed to do was bear away and go with the tide once they heard their finishing signal. Unless the SI's say otherwise, there is no need to sail completely across the finishing line, you can clear it in either direction. The question is should you be racing in these conditions. I once had a National Championship race go inside out when tide forced the first two boats onto the mark but the third boat made it. I then realised that I could be in trouble if I abandoned at this stage, so everyone had a test of their seamanship - but I don't think it was a proper race. I still wonder if I should have protested the boats who paddled their way clear of the line, having finished! I'd like to add a feature to Paul's example: the rest of the fleet is trying to finish. I've been in this situation with very light winds. We struggled to break the line, at which point we have a finish time but still have to clear the line. The RRS don't allow engine use to cross the line to clear it so the only realistic option for clearing the line was to stop trying and allow the tide to drop us back onto the course side, making the boats behind overtaking boats and then it's their problem. A conflict between what is permitted and what is fair. In addressing my original scenario, in the US (based upon US Appeals 16 and 26), the answers to Q1 could be argued as .. In my Q2, i was trying to get a discussion around what Kirsteen has just touched on. I don't find anything in the RRS's that would have us take into consideration "racing traffic" on the determination of racing/finished-racing. That said, consider 5 boats stacked-up on a windward photo-finish at the pin. 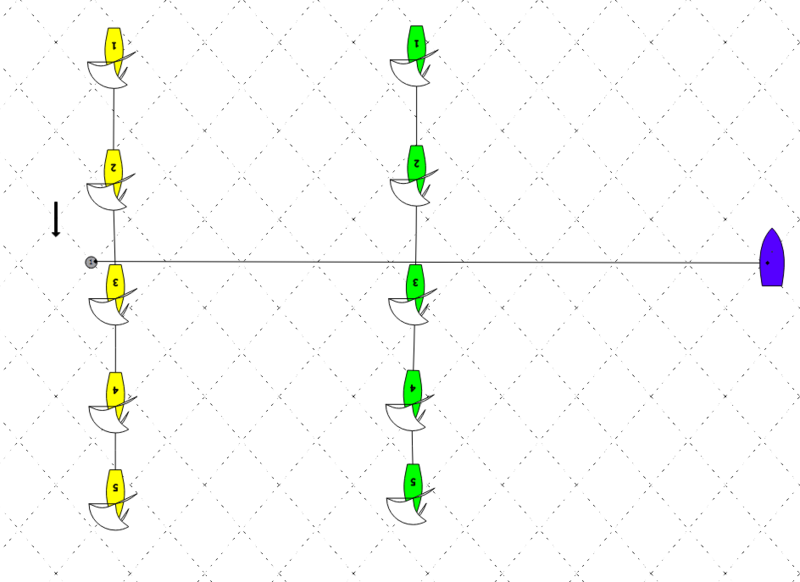 The most leeward boat to port is just making the pin .. and each boat is separated with a boat-width between them. If the starboard most boat was alone, she could be finished-racing as soon as she cleared the line (assuming she was approximately mid-line). With all the boats stacked to the pin, does the pin's "influence" (language from Case 127) transfer through boats 1-4? In my Q3, I was trying to take each boat at the point each boat finished-racing, envision trimming the track I provided at that point, and put ANY OTHER TRACK on it after that point. (oops .. posted accidentally) Does it matter at all what follows? I don't think so based on what I see in the RRS. To Paul's scenario, I'd say Blue finished at position #4. A conflict between what is permitted and what is fair. I do not see your move as impacting fairness at all as long as you are not trying to interfere with other boats. As soon as your bow backs away clear, you are still obligated by 24.1 to, within your reasonable ability, not to interfere with those still racing. I've argued that Team Racing's version of 24.1 should be bought forward into Fleet Racing, which also puts some obligation on those who have finished, if reasonably possible, to not interfere with those who have not yet finished. I'm not sure what the argument is that this mod is good for Team Racing but would not benefit Fleet Racing. TR's D1.1(e) change to RRS 24.1: "‘If reasonably possible, a boat not racing shall not interfere with a boat that is racing , and a boat that has finished shall not act to interfere with a boat that has not finished ." I don't think the boat in my diagram has finished and cleared the finish until position 11. I think the test is that, at each position in the diagram, is a finishing mark influencing her choice of course. Nothing in Case 127 requires the boat to take the shortest course, or the most reasonable choice. She chose to try to clear the finish area by tacking around the committee boat, and at each position on the diagram, the committee boat is an influence on her choice of course. And just to throw in a red herring, many SI's require that a boat not cross the start or finish line except when starting or finishing. Should we alter the way we interpret Case 127 in those instances? That's not what the case indicates. again I have to disagree this is the trap.the boat has a choice she could bear off and cross the line her course is not determined by the mark. to me she was nor racing when she hit the mark. Michael, where is it in Case 127 that says the boat must bear off if that is alternative. Her choice is to go outside the committee boat. At position 4, is she able to do that without the influence of the mark? Are we as a judge required to decide what would be the optimal course for a boat after she crosses the finish line? And what about the scenario where crossing the finish line is precluded by the sailing instructions. How does that change the situation in relation to Case 127? to me you are making it too complex. After she has crossed the line here the finish mark is not influencing her course. is you stopped the diagram there no one would disagree. She chooses a course and that allows her to hit the committee boat but it need not, it is the compulsion os course that stops the boat being considered still racing as in the case example. Yes she has the choice at position 4 so she is nor racing. no we are not required to consider the optimal course. Our test is is her course determined by the mark. it is in the case example but not here. I think our decision is simpler and made earlier than you do. If the crossing the finishing line were precluded that would be a different matter, I would look at again, but do not jump the gun now and make the decision more difficult than it need be. I consider my answer an all fours with the cases including the us cases quoted. to me simple and what you see is best not what might be later. Do not anticipate when a decision on racing can be made earlier. Look at 4 and ask the question with the later track deleted. Would you even look at it a second time? If at four the wind dies and she drifts into the port mark, has she finished racing and therefore not subject to 31? How does that square with Case 127? We don't look at the course of the boat in isolation of what she might have done at any given moment. I contend that, if while sailing the course she has chosen, she is sailing that course because of the influence of one of the marks, she is still racing. And if in my example, she hit the committee boat and we were considering whether or not she finished, her course was influenced by one of the finish marks for the entire time she was sailing that course up until she hit the committee boat. We are evaluating what she did, not what she might have done. Michael said: "After she has crossed the line here the finish mark is not influencing her course. is you stopped the diagram there no one would disagree." That's the point I was trying to make/explore with my Q3 in my OP. Below is my crude attempt to illustrate it with a Position #3.5 in lighter blue. IMO at #3.5 Blue is finished racing as she has cleared the line and at that specific moment the mark is not influencing her. After that moment, Blue's state of being changes from 'racing' to 'finished racing' and no action on her part can convert her into a state of racing again for that particular race. No we make the decision at 4. We cannot wait after a valid decision can be made we seek certainty. The rule matters most ant it is conclusive. the case gives help, basically because of your course you cannot avoid the mark you are racing. here the boat need not hir the mark so it is not racing. You say it with such certainty Michael. But you still haven't convinced me that the course of the boat is not influenced by the mark at 4 given the wind and current. You are right I have no doubt. At 4 he has lots of choice, only one of which causes him to hit the committee boat. He has stopped racing and nothing will shake me from the view. If you look at the 2 US Appeals I referenced, they seem to be consistent. I think we are getting cross-ways because of the word "influence". Wonder if anyone here knows the genesis of the choice of that particular word? Looking at the US Appeals, using the word "restricts" instead of "influence" would work also and be an easier test. Given that the word is "influence" though, I can appreciate (if not agree with) Paul's interpretation. With "restricts" we could simply determine if the boat is clear of the line and whether not, at the first moment thereafter and while she remains clear of the line, she is unencumbered by the mark to take any course, then she is clear of the mark. In practical terms, that would mean that a boat that has finished, cleared the line and is greater than 1 BL from the mark has cleared the mark. I AM not bound by us interpretations. I'm not sure we are getting cross-wise with the definition of influence. It is not a defined word in the RRS, so we use the common definition. And I think Appeal 16 strongly supports my argument. They state that as for 800's choice of course "Failure to clear the finishing marks is not at issue here." In my diagram, the boat is subject to failing to clear the finishing marks from the time she crosses the finish line until she clears the committee boat. And Appeal 26 doesn't contradict my argument. At position 2, neither mark was influencing her choice of course. She had cleared the finish line and there was no question that she had cleared the marks (their conclusion). 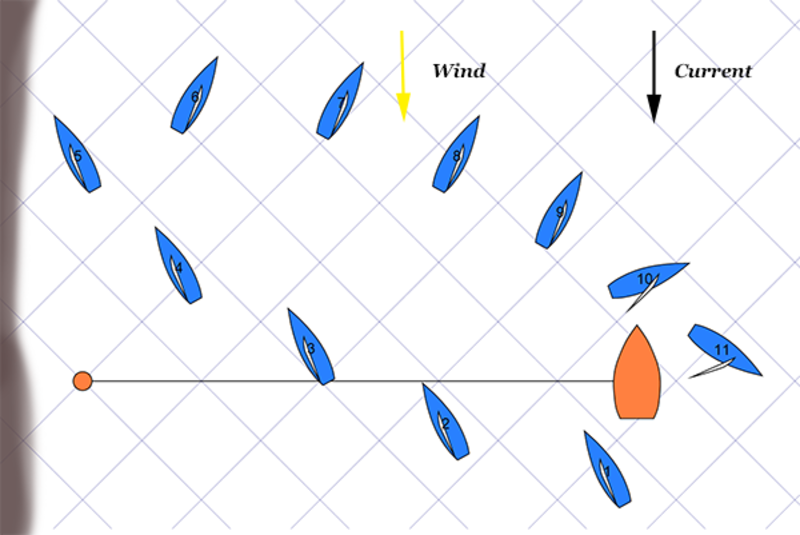 However, had the wind been such that when she crossed the line there was a question of whether or not she would clear the port mark when she chose that course (granted it would have looked much different had she been struggling to get across the line in light wind), she was sailing her course influenced by that mark. And I would argue she hadn't finished. In almost any scenario it woud be possible for a boat to assume a couorse directly towards a finishing mark (FM). Her choice would probably be not to assume that course, thus [the positioni of] the FM could always be said to 'influence her choice of course' (Case 127). This construction is patently absurd, and in interpreting rules we must avoid absurdity. I think the second condition of Case 127 has to be 'read down' as saying '... no finishing mark is immediately influencing her choice of course.'. This would be consistent with US Sailing Appeal 26, whihc while 'binding' on nobody, is an authoritative decision which all judges should seek comity with. @3 [trivially] B has not cleared the finishing line (FL) and is still racing. @3 + delta and after, B has cleared the FL and could then bear away onto a course towards the pin (or tack and bear away towards the RC Vessel), but she then has sufficient time and space to further change course to avoid those FM. Thus her choice of course is not immediately influenced by the FM, and she is no longer racing. John, that would be fine if that is what the case said, but it doesn't. Once again I agree with Michael. This disagreement illustrates why a PC can be 1 person whilst (don’t you love that word) an international jury must be 5. The Rule + the Case create the possibility to apply subjective judgement about "clearing the mark", or "influence the course", etc... Michael and Paul would vote in opposite way in Pauls case. Both can find enough arguments for their decision. I think in present rules we have to live with this ambiguity. That is why I think about suggestion, which would simplify the life of competitors, as well as officials. (..."clearing the mark" would be checked by the line abeam from the aftermost point of the boat versus the real outline of the marks). It could be introduced in the rules, or in Cases. Than, position 4+tack, or position 5 would be the last one in question. At the same time, the preamble of Part 2 would "force" this boat to not to interfere with boats still racing + avoid contact (which could cause serious damage or injury) with any other boat. An interesting situation. Late to the party here, but I must agree with Michael as well. I post to say that I respectfully disagree that Appeal 16 supports Paul's argument. As I read the appeal, the appeals committee's assertion that "Failure to clear the finishing marks is not at issue here" is made because it is clear that 800 has finished. As they say, since she has finished, she can't be penalized for breaking 10, or 14 unless the incident resulted in injury or serious damage (note the extra qualification in the preamble; "...serious damage..."). She is DSQ because she breaks 24.1, a rule that by definition she can't break until she is no longer racing. 546 is still racing, and when she breaks 14, she needn't cause damage that is "serious" to get penalized. Any damage will do, so she gets DSQ also. In Paul's example, I believe Blue is finished at #4 because she has crossed and cleared the finishing line and marks. 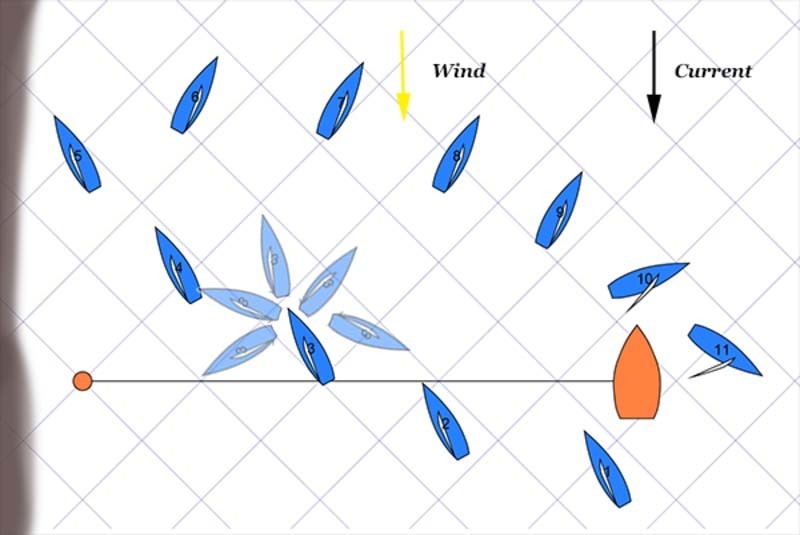 There are no other boats in the diagram, so 24.1 doesn't enter into that situation, but even if there were, those boats wouldn't change whether or not Blue had finished, only if she was limited by her obligation to keep clear of boats still racing. I respectfully submit that her choice to sail a course that thereafter brings her into contact with a mark is exactly the situation described in Appeal 26, in which the appellant is found to have finished racing immediately after clearing the line, so her DSQ for touching a mark while finishing is reversed by the appeals committee and she's reinstated in her finishing place. I believe both appeals are consistent with Case 127, and all of them support the judgement that Blue is finished at #4 (or even #3.5, in Angelo's follow-up example). It seems Paul's argument is supported by the phrase in Case 127 that reads; "...a boat that clears the finishing line and then continues to sail toward a finishing mark, where current sets her into the mark, is still racing and has broken rule 31." I submit, though, that that confusion can be resolved in the case Paul puts by the observation that Blue doesn't "continue" to sail toward a finishing mark. She tacks, bears away, and then reaches, in order to get close to a mark she wasn't sailing toward when she finished, and she could have made several choices after clearing the line that wouldn't bring her close to either mark. I'm not sure if the grey area at the left of the diagram is intended to be a shoreline, but even if it is, Blue is clear of the line by over a boat length at #4, and by more than that when she tacks. (Also, if it is a shoreline, I'd want to know what the RC was thinking to set up a "coffin corner" like that just after a finishing line!) It seems to me that the language in the case is only consistent and sensible when the finisher has no choice but to "continue" to sail toward the finishing mark she ultimately hits, and to me, that suggests both a consistent course and a level of immediacy that I don't see here.